'Eramosa Ridge' (Chuck Chapman, R. 2009). Seedling 96-X-48. TB, 42" (107 cm), Midseason bloom. 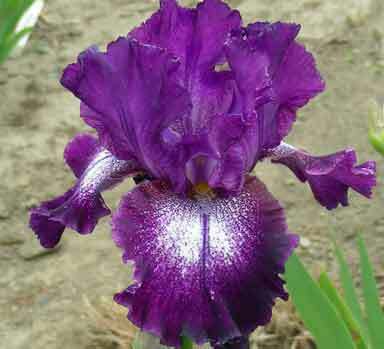 Standards royal purple, some white near base and on inside of petals; style arms royal purple; Falls white ground heavily dotted and stippled royal purple, small white area at center, solid purple edge; beards purple base tipped light bronze; luminata plicata. Parentage unknown. Chapman 2009. Winner of Moscow International TB Iris Competition 2012 (first place). Excellent bud count and branching on this super hardy plicata. There are a lot of people complaining about plicatas that are tender and rot easily. Complain no more. Not only is this plant hardy, it increases rapidly, and would appear to have a bad taste for iris borers. Standards are near solid royal-purple, and falls have a wide rim of royal-purple. With some doting and streaking inside white centre. Violet-purple beards. Being heavily used in plicata breeding to work towards hardy luminatas and glaciatas.96-X-48- parentage unknown. jpg BHP_8022-X2_eramosa_ridge.jpg manage 132 K 12 Feb 2016 - 04:31 BrockHeilman Please contact Brock Heilman for image use. JPG eramosaridge03.JPG manage 69 K 21 Apr 2014 - 13:24 Main.TLaurin Photo by Don McQueen,London, Ont. Canada Zone5.